Should a company spend more time critiquing themselves or their competitors? Should a family spend more time evaluating themselves or their neighbors? Should a team spend more time training themselves or questioning their opponents’ fitness? If Republicans and Democrats focused their critiques on their own party, they’d lower the national temperature, make space for conversations, and they’d actually make their own party better. I’ve noticed that when someone tries to do this, they are often attacked by members of their own party. Any self-critique is viewed as mutiny. So it’s going to take some courage to do this, but isn’t it the right thing to do? Doesn’t it offer hope to the process? Doesn’t it show love to your neighbor? 2. Engage before you contend. Information has never been easier to attain, yet more difficult to discern. If we aren’t careful, we’ll “speak-up” before we’ve done our homework, wounding people in the process. Jon Huggins and Jer Swigart, in their great book, offer a solution: engage before you contend. Consider the refugee crisis. Before you start contending (voicing opinions, posting on social media, or supporting a cause), first engage with people intimately involved. Take a former refugee out for lunch. Talk to someone who has experience with border-control. Read first-hand stories. Pray about the situation. And then, just maybe, you’ll be ready to contend in a way that loves your neighbor. 3 & 4. Be quick to listen and slow to speak. James 1:9 says, “Be quick to listen and slow to speak.” You can’t be both quick to listen and quick to speak. Something has to give. When you are quick to speak, you offend people quickly. But also when you are quick to speak, you lock-in your thoughts and they become extremely hard to change. When you say something out loud or post something online, you are very apt to defend your position or candidate, even when it’s ludicrous to do so. People who are quick to listen are teachable, wise, and humble. Listeners are good friends because they communicate that you matter. Don’t you love being around good listeners? One of God’s great gifts to us is that he listens. So when you listen to others, you are acting in a Godly way and taking part in his work. So please, love your neighbor by being quick to listen and slow to speak. 5. Be slow to anger. If we could just step back for a moment, we’d see how often politicians and the media are playing us. They are luring us to fear and anger, which they hope will turn into votes and clicks. Don’t take the bait! Yes, God created you to sometimes have the emotion of anger, but he also commanded you to rid yourself of bitterness, rage, and anger (Eph. 4:31). If anger is consuming you or if you can’t be informed without being consumed, you need to take a break from politics, or the news, or both. “If your right eye causes you to sin,” Jesus said, “cast it out.” And if your right-winged or left-winged media causes you to sin, cast it out. It’s better for you to trash your news-media than for your anger to trash you. 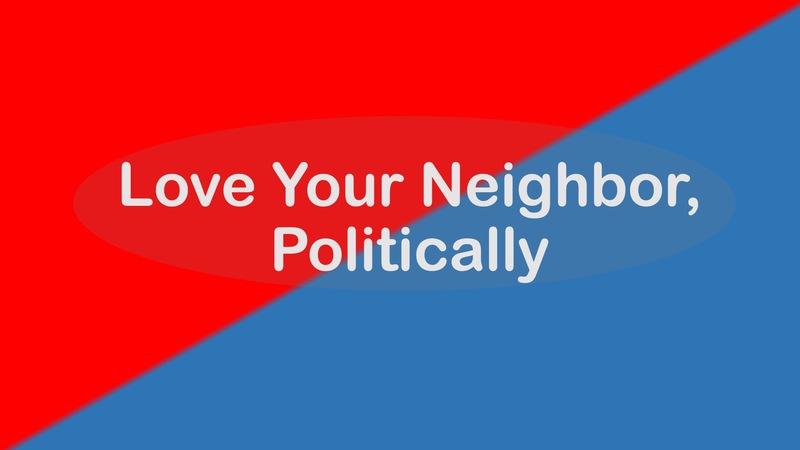 Your neighbors need you to be a person of love, joy, and peace, not consumed by anger. If you love God and love your neighbor, you’ll never trade the Kingdom rulebook for a partisan playbook. 7. Quit yelling at the opposite extremes. Extremists exist on the far edges of both political parties. Unfortunately, they garner a majority of the attention. Those on the right are quick to mock the crazy leftists, while those on the left are mocking the crazy right-wingers. We’re left with two sides talking over each other, building and burning straw men, and stereotyping their opponents with worst-case examples. It’s now gotten to the point that people are creating false news stories and memes with the hopes of riling up their base. People are losing their minds over things that don’t even exist. There are reasonable voices of those who disagree with you. Find them and listen, ignoring the inflammatory invitations of the extremists. By doing so, you’ll love your neighbor. 8. Reject simple answers to complex issues. Simple problems need simple solutions. When we can do simple things, that’s great. However, when we offer overly-simple, cliché-soaked, ignorance-induced solutions to complex issues, it belittles the harsh realities of people wrapped in those issues. Worse yet, it poses danger to their very lives. One of the reasons our country has failed in the area of immigration reform is that it’s complex. Too many politicians on both sides keep making simple statements, which lead them to oppose honest attempts to tackle the nuances involved. The other day I heard a lady say, “I don’t know a lot about that issue, so I’m trying to learn.” How refreshing! She rejected a simple answer and postured herself to learn. She loved her neighbor. 9. Acknowledge how faith traditions affect political positions. Do you assume that people with differing political positions care less about God or the Bible than you do? Can you imagine the possibility that there are people who love God with all their hearts, but hold vastly differing viewpoints? Your faith background has probably shaped your political leanings more than you know. The book Five Views on Church and Politics,[iii]which details how faith traditions shape one’s political views, expanded my horizons. For instance, the Anabaptist view (which is on one end of the spectrum) believes any political allegiance jeopardizes one’s spiritual purity, so political involvement should be avoided (that’s a rough sketch view that merits more than I can give it here). Now, we may not agree with that view, but I think a good student of the Bible could comprehend how someone could reasonably come to some of their conclusions. When I read through the book, I found myself agreeing with aspects of all of the different faith traditions. Some faith groups have veered one or another based upon emphasizing certain points of Scripture over another. Others have simply experienced radically different life events, which shaped the focus of their study. Understanding faith backgrounds promotes dialogue, grace, and neighborliness. Either you believe Jesus’ command to love our enemies or you don’t. Either you believe it is good, right, true, and applicable to every situation, or you don’t. I hope you believe it and obey it. The world speaks of tolerance, but we aren’t called to simply tolerate people. We’re called to love them wholeheartedly, beyond on what they deserve. What if you replaced political zingers with unbridled, practical, prayerful acts of kindness? If you’ve committed to loving all people, can you align yourself with any politician or party who wants you to hate another person or group of people? That’s a question with which we all need to wrestle. It will leave us praying for discernment. I think Jesus knew that if we wouldn’t love our enemies, we wouldn’t love our neighbors either. Eventually, your enemy will move next door, or your neighbor will start voting like your political enemy. Jesus’ command is to love all. When you and I begin to love our enemies, we’ll build bridges for people to befriend others and God – who is Love. And when we begin to love our political enemies, we’ll learn to love our political neighbors too. If these words have resonated with you, please read my book, Dancing in No Man’s Land. When I started writing over 5 years ago, I had no idea how much worse things would get. I’m dismayed by the polarization and hate, but I’m also in awe of God’s timing with this book. I’m praying it helps you learn to pursue both truth and peace. Reading it is a practical step you can take to love God and others, even in our hostile environment. This post was based upon a series of 10 short videos. You can view them here. [i] Tony Evans, Kingdom Man: Every Man’s Destiny, Every Woman’s Dream (Carol Stream, IL: Focus on the Family, 2012). 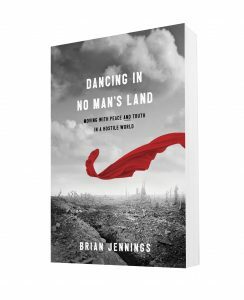 [ii] I dive deep into this account in chapter 10 of my book, Dancing in No Man’s Land. [iii] Amy E. Black and Stanley N. Gundry, eds., Five Views on the Church and Politics (Grand Rapids, MI: Zondervan, 2015). For an excellent summary, listen to the Not So Black and White podcast entitled Five Views on Christianity and Politics (Episode 18).